How to tailor your training for PCOS, Hashimoto’s, low thyroid, adrenal issues and perimenopause. Are you one of the millions of women wondering what exercise plan will finally get you results given your hormone issues such as PCOS, perimenopause, low thyroid, adrenal fatigue, Hashimoto’s and other autoimmunity? 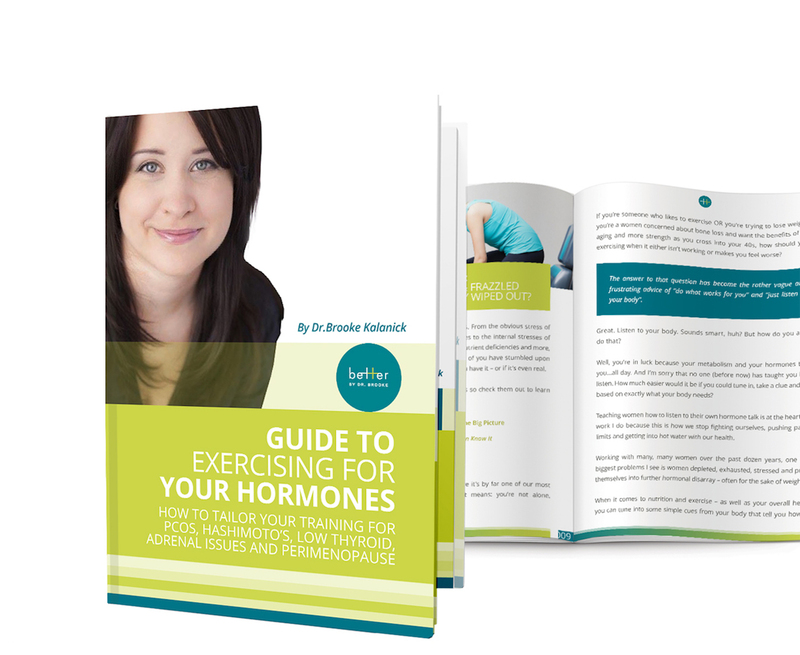 Tailor your training for PCOS, Hashimoto’s, low thyroid, adrenal issues and perimenopause. What if you’re spending your precious time and energy exercising with little to show for it? What if you’re like so many women following the latest fat-loss advice and exercising more intensely and lifting more weights, but you’re not getting the promised results? And what about those of you whom exercise makes you feel worse rather than better? When your hormones seem to have a mind of their own and you’re dealing with PCOS, Hashimoto’s or perimenopause, adrenal fatigue, figuring out how to exercise is tough. You just don’t seem to respond the way everyone says you should. What should work just doesn’t. If you’ve dealt with adrenal issues or HPA axis dysfunction (commonly referred to as Adrenal Fatigue) you’ve probably been told you can’t exercise intensely. So is it just yoga and walking? If you’re experiencing hormone decline with perimenopause and frustrated with your body you’ve probably been told simply to “exercise more”. Is this advice giving you little results or even has you gaining weight? If you have a low thyroid you’ve probably come across two very opposing stances for weight loss: exercise gently (yoga, walking) or exercise only very intensely (short and hard) and neither work well for you as the light stuff gives no results and the intense stuff wipes you out for days. Maybe you have PCOS and are simply frustrated with the utter lack of fat loss that happens even when you exercise regularly or you feel you get “bulky” from exercise. What’s a girl to do? Or if you’re simply a woman who likes to exercise OR you’re trying to lose weight OR you’re a women concerned about bone loss and want the benefits of better aging and more strength as you cross into your 40s, how should you be exercising when it either isn’t working or makes you feel worse? The answer to that question has become the rather vague and frustrating advice of “do what works for you” and “just listen to your body”. What you need is to have someone show you a starting place, a template and then be taught how to actually listen to your body in a real, concrete way to adjust that template to work for you in all your metabolic uniqueness. To actually find what works for your body you have to learn to decipher your hormone talk. I will bet you didn’t know that your hormones are taking to you all day, telling you whether or not they like your diet and lifestyle. The problem is no one has yet taught you how to listen. But this program will do just that: teach you how to truly listen to your body and finally find what works for YOU. Women of the world, I hear your frustration and I created this program after years of working with women just like you, thousands of workouts and a lot of research. I created this do it yourself program based on the exact principles I follow in my office to help you get better fat loss results and most importantly leave you healthier and stronger.